Most people who get into fishkeeping do so because they enjoy being able to sit back and admire a beautiful aquarium scene. However even with the best care, aquariums tend to become dirty over time. Algae and pollutants can build up to spoil your view of your fish. How can you get the aquarium clean again? When it comes to cleaning an aquarium, the first thing you need to know is how to go about it without harming your fish. This is important even if, during a major cleaning operation, you're temporarily moving the fish into another tank. Unfortunately, many people who don't know what they're doing try to clean aquariums the way they would clean other household surfaces, using soap-based products. This is a really bad idea, as soap is highly toxic to fish, damaging their delicate mucous membranes, and it's almost impossible to be sure that all traces of soap are effectively removed after such cleaning. You should only ever clean your tank with plain bleach or with cleaning fluids specially designed for the purpose. Unless you're aiming to start from scratch, when cleaning your aquarium you'll want to look after not only your fish but also the colonies of waste-processing bacteria on which they depend. If you move your fish to a temporary tank it's a good idea to move some gravel with them to keep these bacteria safe, but the best tank cleaning operations will cause minimal damage to those bacteria which remain in the main aquarium. Most commercial tank cleaning fluids will not harm these bacteria. When thoroughly cleaning your tank you should use a piece of plastic tubing to siphon dirt out of the gravel (a sandy substrate can simply be sifted around to remove dirt). This is especially important if you have an undergravel filter, which will trap large particles of waste in the gravel where they will decay. Mechanically cleaning gravel won't harm indigenous bacteria provided that you keep it damp at all times. There are some bacteria, of course, which you don't want in your aquarium - the kind which make your fish ill. After a thorough clean, it's a good idea to soak your tank and equipment (including things like nets which are not always in the water) in a solution of aquarium antibiotic, in order to kill off dangerous organisms. Soaking in a methylene blue solution is an effective alternative, but should be avoided if you intend to introduce sharks, rays, or sensitive invertebrates to your tank afterwards. 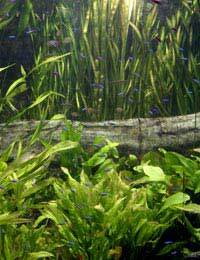 No matter how efficient your cleaning regime, any properly lit aquarium will eventually suffer from algae build-up. Some forms of algae are extremely good at clinging to glass and can be difficult to get rid of. Provided there are no fish in the aquarium at the time, you can use plain bleach to help with this, but you must rinse thoroughly afterwards. A specialist product like bi-aquaculture or UltraLife blue green algae remover, which can be added even whilst your fish are still present, can make life easier, but it won't always get rid of the most stubborn stuff. For this you may need to scrape the sides of the tank with a razor blade (or, if your tank is acrylic, with a firm piece of plastic - a short plastic ruler can be handy for this). Follow up with an algae-remover treatment to prevent the niches you have cleaned from being immediately recolonised. If you have a hard water aquarium, or even a neutral water aquarium, you will inevitably get lime build-up on the glass and filter equipment in the long term. This can be very difficult to remove, but specialist products such as Lime Off and Aquari Clean can help to break it down chemically without leaving residues which are harmful to your fish. Your local fish shop should be able to supply these, or you can order them over the internet. Keeping your aquarium clean is an important part of looking after your fish - just don't forget that their interpretation of clean may differ from yours, and that what looks good to you might not be comfortable, or even safe, for them. If you're prepared to put in some physical effort, and if you stick to specialist aquarium products, you should be able to establish a cleaning regime which suits everybody.